$6.00 validation with purchase. Limited availability. Honolulu’s top restaurant venue for Hawaiian music is one of the island’s favorite gathering places for casual drinks and tasty pupu appetizers, from kalua pork nachos to ahi poke. Kani Ka Pila means “a gathering around music,” and you’ll find Hawaii’s most beloved musicians performing contemporary and traditional Hawaiian music nightly from 6pm to 9pm. Reservations only available for parties of 10 and over. Didn't realize this was just the pool side dining at the outrigger hotel. Band was very loud and you could not have a conversation. We moved to another restaurant when we realized what this was like. They should let you know this in their website... we were looking for a proper dining experience. Would be fine for snacks but not dinner out. The live entertainment by Ho'okena is the best of all Waikiki. And the food and service are perfect. Can't beat it with a stick! We are locals and go for the authentic local music. 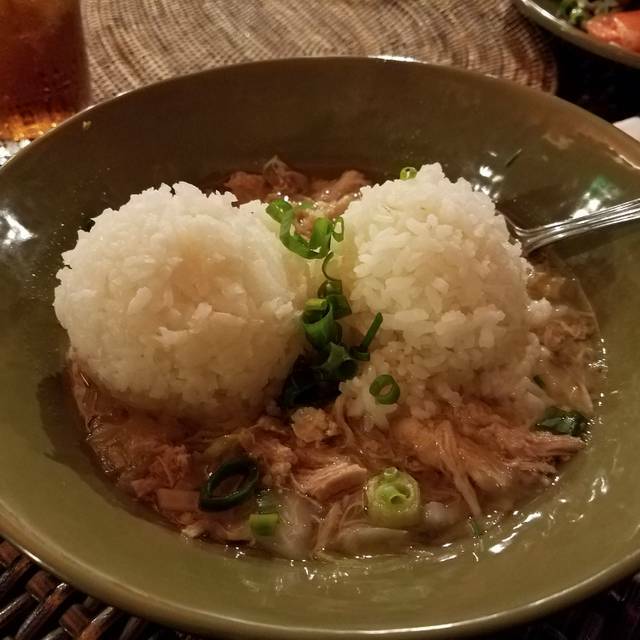 Kanakapila Grill features some of Hawaii's premier Hawaiian entertainers and musicians and we love the relaxed, local atmosphere where my sisters can go up and dance their hula and we can sing along with favorite songs. Guests and tourists may not realize the top quality of the entertainment schedule but we do and look forward to a fun night of beautiful music. Food is okay, service is always good, but the surroundings and music make up for any lack. Local entertainment was a treat, Mai-Tais were were a cut above the rest and the Chicken stew was yummy! Server was great! Really liked the fried rice. The band on Friday night was awesome! Good food and beverage. Great music. Thank you for fabulous real Hawaiian music by star performers. Server Bernie was as kind and sweet as anyone could be. Food was fresh and good. Never thought I’d see a wine pairing for Loco Moco but it was right on. Thank you for keeping a place in Waikiki where we can take guests who want to hear local music by local musicians and I don’t mean the very nice Mr Johnson . Mahalo nui. The live music was nice and the server attentive and friendly but the food was below what we expected in terms of quality and preparation for the price. The bar area guests were a little loud which made quiet conversation difficult. Would give it higher marks if the food quality was a bit better. Mainly came here for the live Hawaiian music, which was outstanding. The service was excellent, and we enjoyed the fried calimari, backyard chicken and Kahlua pork and cabbage stew, which was their "Pop's on the Stove " special stew of the night. Prices were reasonable especially with the free entertainment. My only complaint was the noise level was not conducive to listening to the music, especially as the bar patrons kept getting louder and louder. We made reservations for eight people but when we arrived at the restaurant, they had only reserved a table for two. Leslie and Michel bent over backwards to find suitable seating for our party. The weather was bad but the music was outstanding! We will be back to, hopefully, the correct table. In addition to good food, there is fantastic live local music every night. Lots of local folks come for the music and often get up to hula. Wonderful venue to join friends. This is the BEST place for good, local live music. The caliber of musicians that play here is so high! The atmosphere in the evening somehow manages to be fun and casual, and intimate and romantic at the same time. I would recommend Kani Ka Pila Grille as a must-visit while in Waikiki. We love to visit for the live music in the evenings whenever we're in Honolulu. 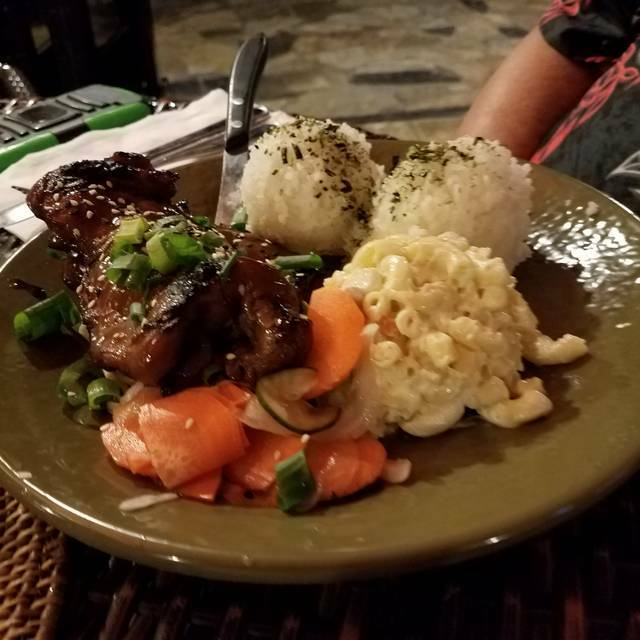 Food is good, service is friendly, atmosphere is relaxed, and the authentic Hawaiian music is much appreciated and always good. The service was very slow ! We waited about 15 minutes before a server came to our table. The appetizer took over a half hour and the entrees were not worth the price . I ordered short rib but it was not like any short rib I’ve had before and was very salty . Overall not a good dining experience . The only saving grace was the live entertainment . A wonderful casual atmosphere with great bartenders and music. One of our favorite places when visiting Waikiki. This has your typical bar meal fare, nothing too complicated or fancy. The service was great though, I waiter even switched my moms sides because had said when order her main dish she didn’t like onions so he gave he an onion less side rather than what she had asked for- she was really impressed. I think the live music is the biggest draw here. There was a great band(3 guys) playing Hawaiian songs- no pop music covers just happy cheerful well sung Hawaiian song. Great ambiance but a little too dark the lanterns on the tables don’t do a whole lot. Overall great place. Friendly staff, reasonable prices, good food. Not the place to go if you want a quiet meal. Great ambience poolside. Wonderful local entertainment, absolutely enormous servings. Only downside was the loud young women at the bar. An simple venue, and enjoyable. Poolside style. Thai crunch salad and poke very good choices. Also enjoyed mahi fish+chips. Satisfying. Good attentive service and excellent dinnertime traditional music make this a cost effective and desirable place to enjoy happy hour or dinner.